Allianz is leading a consortium that reinsures Vale against liability claims, meaning the Munich-based insurer is involved in the damages imposed on Brumadinho. However, sources from the industry have claimed that environmental damages would not be covered under the contract. Vale has insurance against damage to its own facilities and business interruptions, called insurance against so-called “lost profits”. This model had also been adopted by Samarco, whose 2015 dam collapse caused damage to third parties and the environment amounting to several billion euros. 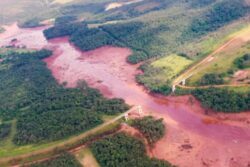 The largest part of this loss has not yet been paid, however Samarco itself received up to two billion reais for lost profits (the equivalent of around 500 million euros), from Allianz, Münchener Rück and Hannover Rück. 8 Vale’s incoherency regarding safety measures and the resulting tragedy has resulted in its shares falling by more than 20% on the Sao Paulo stock exchange since the incident. Facing Finance together with Misereor and Brazilian partners affected by the 2015 tailings spill in Mariana have engaged with Deutsche Bank in 2018 to push for improvements at Vale or divest. However, recent information shows that Deutsche Bank as well as UnionInvestment, Deka and Allianz Global Investors still hold shares of the mining company. As the recently published Dirty Profits 6 report shows, major European banks have continued funding Vale even after the 2015 disaster, among these HSBC, BNP Paribas, Crédit Agricole, ING and Deutsche Bank. Posted in News & Media. | Tagged Allianz, Brumadinho, Dam collapse, Iron ore, Mine, TÜV Süd, Vale.